Born For Geekdom: Don't listen to us Lucas! I was writing THIS today and I was inserting some links. Naturally, I linked to IMDB's Crystal Skull page. After my article was done and published, I went back to wander around on the page some more, just browse for a little while. Then I got into the comments section. There were some good solid discussions. I myself was on a roller coaster about KOTCS last year when it was released, right about this time actually. But as the year has gone on, I don't care about all the things I initially complained about. I care, of course, but not enough to never want to see another Indy again. I just want them to make another one, as soon as humanly possible. I'm an addict and Lucas is my pusher. 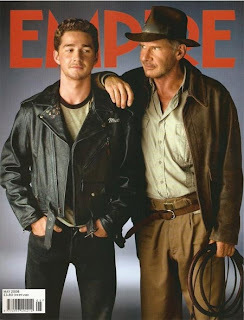 I NEED more Indiana Jones. "Temple of Doom" is a film that I absolutely LOVE. But I know a lot of people who hate it so much they wish it had never been made. Well, maybe "Kingdom of the Crystal Skull" can just be the new Temple of Doom. A weak entry into the series, not everyone's favorite, but one that people can allow themselves to like. I own it. I watch it from time to time. There are things I don't like about it, but there are things I don't like about every movie. That doesn't mean it should be disowned and the franchise abandoned. I've been at a crossroads lately. I almost crossed the line into that kind of fanhood that just feels miserable. Where you hate everything because you're a purist only. Where you can't ever have fun at the movies because you're just counting the mistakes. If I was that rigid and unforgiving when I was a kid, I wouldn't even like any of the movies that I love now...Star Wars, Indiana Jones, Star Trek, Back to the Future, and more. I was becoming a snobby fangirl instead of a geeky fangirl who actually loves what she obsesses over. So where was my turn-around? The new Star Trek. You see, Star Trek has taught me a lesson. One that seems counter-intuitive to everything I've been taught over the years. It's that nothing is sacred. Our beloved franchises CAN be resurrected. I have hope again, I feel less cynical. Less like the "nothing ever makes me happy"
movie geek and more like the, "bring it on" kind of fan.